First, if you haven’t seen this new gem from ArenaNet then feast on it in as high a def as you can muster. It’s an updated video version of their earlier manifesto newly born for the upcoming games conventions. The video starts out with a few of ArenaNet’s top devs giving some quick phrases on their design philosophy to shatter the current MMO mold. The video is interspersed with in-game footage and a little concept art, and about halfway it switches over to full in-game footage showing some very impressive events. The locations largely focus on the human starting zone and the Brand, a late game charr zone. According to the accompanying ArenaNet blog post Walking the Walk these will be the two areas gamers will experience in the convention demos. A deeper look at the video and the post after the break. Players that choose to play as a human at the conventions start at level 1, and they can experience the personal story, the huge city of Divinity’s Reach (with tons of minigames), and the event system with perhaps a boss a beginning human player might see at level 1. That beauty is an earth elemental summoned by an enemy [centaur?] shaman. Quite a step up from wolves, boars, and pumpkin patch bandits (and, yes, “killing ten rats”). Honestly, if I was playing I don’t think I would leave the capital city, Divinity’s Reach. I would probably find the nearest bar and get to bashing teeth. I am sure with the amount of content hinted at in the capital city alone many gamers will feel they didn’t have nearly enough time with the demo. 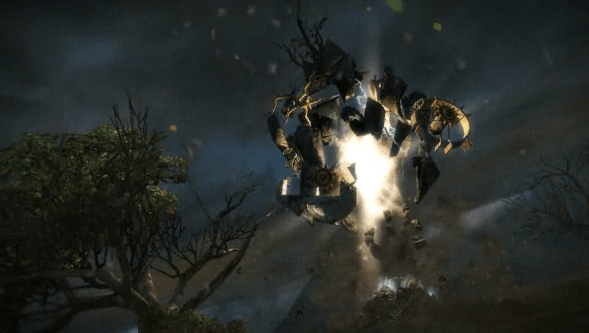 Braver players can get in to the shoes of a level 47 charr player in a later zone near the Dragonbrand, where an elder dragon of such power simply flew over the land and corrupted everything beneath it. Players of the original Guild Wars: Prophecies might remember seeing the Great Wall before the Searing. Ironically, the charr had to build their own wall… only theirs is a bit harder. The Shatterer is believably one of the elder dragon Kralkatorrik’s greater minions, possibly Kralkatorrik’s version of The Great Destroyer, which was a general for the elder dragon Primordus in Eye of the North. Regardless, this open world “boss” will be available to fight at gamescom and PAX, and he is painfully hard. What’s really interesting is nobody (outside of an NDA) has seen the demo, and just from the new video stories are already being told. Of course ArenaNet has to put their absolute best foot forward, but I kind of doubt that we will be seeing everything Guild Wars 2 has to offer. I can’t wait for the stories to start coming. Is it OK to swear here? So, anyway, all I can see is disappointment from here on out. I mean, how can they possibly deliver on all the great stuff they are promising? It’s like they climbed into my brain (the one that picked Kill Ten Rats as a name for this site because it represents all that is wrong with MMOs in my opinion) and grabbed a checklist of things I’d love to see and started checking things off the list. I DARE YOU TO DELIVER THE GAME YOU ARE PROMISING! I DOUBLE-DOG DARE YOU!!! FYI for our readers: if Guild Wars 2 delivers, you’re not going to see much else on the site for a while. Maybe I’ll go to a strict “2” mode: Team Fortress 2, Torchlight 2, Guild Wars 2… I may need to buy other sequels. The one thing they will certainly not deliver on for some players is permanency in dynamic events. Their system is perfect for someone who keeps playing as they are supposed to: they move from area to area, and never stay in the same zone for more than a couple of hours. While they’re there, the consequences of their actions are obvious and indeed permanent. You wouldn’t expect players to complain that things are different if they come back there a week later because their friend tells them a cool event is going on, here’s a problem: what if you play shortly in an area, complete one event, logout and you log back in one day later, only to see that one event returned to the same part of the cycle (or a seemingly contradictory one) as it was in when you logged in the day before? That won’t happen much of the time, but when it does I suspect I’ll feel pretty bad even if I know why. On the other hand, permanency for the personal storyline could easily deliver on our wildest dreams. More importantly perhaps for ‘Kill Ten Rats’, the whole idea of replacing ‘Kill Ten Centaurs’ by seeing ‘centaurs running to the trading post, knocking the walls down, burning and killing the merchants’ is one that is hard to implement at first but once the framework for doing that kind of thing exists, should be fairly easy to deliver on and make it tons of fun. So I’m very optimistic there, and this alone will surely help a lot in making levelling not feel like grinding. I do believe, however, that if they deliver on most things, it would be fair to call Guild Wars 2 the most innovative video game of all time, excluding genre-setting classics of course (which are extremely innovative but in another way). We’ll see how it goes. Is that thing really called the Steeleye Span? Apparently, yes. Glad to see I’m not the only one who caught the reference. thanks for letting us outsiders to british folk know that was a reference. if you haven’t played the original game, arenanet is notorius for allusions (they seem particularly fond of monty python and video games from zero wing to world of warcraft). What, you didn’t like the “Drakes on the Plain” quest? It probably intentional that the earth elemental is so big and obvious, not only to impress new players but making it hard to miss for people only starting to get to grips with the world. Would expect more subtlety later on. The centaurs careening about the place and blowing things apart, again very dramatic and obvious, though not saying that it wouldn’t be fun. Blizzard released a Q&A about the revamped Darkshore yesterday too, there’s a big obvious whirlwind of destruction in that zone as well, with a major lore figure at the centre. Sure a lot of players are going to be attracted to gawk at it, but even though players can pick up the story from that point, it’s intended to begin at an earlier quest hub. There are two restrictions on the players, not being a high enough level is the main one, but for some not having the complete story or missing quest chains is another. I admit that I’d be reluctant to jump into the middle of the story and instead submit to doing the early quests before reaching that exciting lore moment. It going to be hard to change from following a story, fitting the details/quests together in a coherent way, to what exactly? Not worrying about the details just what’s happening in the here and now, the story of your character’s journey, what they experience, not that of the whole world? Great video btw, looking forward to next week to see how some of it plays out. I think it’s going to be very hard. Hopefully the personal story acts as a guide through the zones because that will be necessary. Players need more purpose than pure exploration, which is what the event system would be without guidance. I also worry about event jealousy, where a certain string of events caused a cool event, but that string of events is hard to do (either to win or to lose). Yeah I’m confusing two things, there are two motivations, motivation to uncover the story and completionist tendencies to see all the events, not mutually exclusive but one is about deducing the sequence of events and the other more about ticking the boxes. Personal story could cover a lot of the story and motivation, the grand scheme of things, for example explaining why the centaurs or bandits attack. The event system sounds more modular and episodic, probably very simple stories, it doesn’t matter why the centaurs attack, they are doing so here and now, do something about it! I think completionists are going to be in for a lot of headaches when it comes to seeing all events. I think it depends some on if you expect to do everything on a single character. I plan, as usual, on having lots of characters, so things I miss on one of them will very likely happen at some point on another. That will be a nice change from having each character go through pretty much the same exact experience. 1: They’ve specifically said that many of the big event “hubs” (chains) are woven into the personal story. That is, your personal story will be talking about bandits attacking x village, and send you to an area where the bandit-centric event is going on. You won’t know exactly what phase it’ll be in when you get there, but you will be looking for bandits. There are also the little mini events that aren’t really explained, such as putting rabbits into hutches, or being turned into a pig. Those are probably pretty few and far between, just talked up a lot since they’re neat and sort of novel. 2: As for completionists, it will probably be a pain for them, yes. Although, with the sidekicking system is should still be pretty engaging to go back into earlier zones to try to see events again at a different stage. I’m actually hoping that sort of behavior is pretty common, it would mean that there is a lot of interaction between the more experienced players and newer people, and would keep people active in all the zones, rather than concentrating everyone in the endgame areas. Either way, I think Anet is aware how differently their system requires you to play, so hopefully they’ll sort of ease people into it some how. I guess we’ll find out with the demo, huh? they’re apparently easing in players through all the game mechanics over the first 15 levels (the last being the traits system). i do like the idea of the events system (with the sidekick level-modding) keeping people from congregating in endgame zones. i think i remember someone at anet implying that as a goal. If they can deliver what they promise, then they will redefine “ADDICTION” at the same time I’m afraid. Some cool stuff is going on but yeah… you must log out in 2 minutes? You ain’t gonna wanna log off. I really need a basement for my apartment… so I can lock myself up once GW2 releases. That’s actually a really interesting point. Do you design a game with player’s obsessive tendencies in mind? The norm in MMOs these days is to make a game where you can (and must) do *everything*, exactly the same as the next person, and exactly the same as your other characters. To me, the value in saying “you will only see a slice of the world, and it will be unique to your play-through” is obvious. But many people will find it really irritating and frustrating. It’s a thorny problem for Anet to deal with. Then again, it’s not like they have been designing for the mainstream WoW nut in the first place. They do their own thing and tell players to deal with it. On another site, a commenter was upset at the idea of the easy leveling. This seems to be his main pleasure in MMOs. So, yes, ArenaNet knows that type of player exists. The one who wants the proof that he/she spent umpteen hours in the game leveling up so they could go find uber gear. But ArenaNet is after all the other players, including the ones who hate leveling up, hate stupid quests, don’t have lots of time to spend in game every day, don’t have an extra $15/mo to spend, don’t want to play the same game but in a different setting. In other words, us. They were very surprised at selling 6 million copies of Guild Wars in four years, but I don’t think they will be surprised at the sales figures this time. As I put it on another site, I think ANet is not trying to appeal to every MMO player out there (raiding is out, steep leveling curve is out, FFA PvP is out…) – they’re trying to cast their net across genres, to capture people who like MMOs but don’t like grind, as well as people who like single player RPGs but haven’t played MMOs before, or people who like FPS games and have avoided MMOs for their “static” combat. That is to say, rather than trying to please “everyone” (i.e. every MMO player) and get very deep penetration in the MMO market, they’re trying to appeal to a broad array of players across multiple markets, pleasing people who like action, story, cooperative play, FPS style hot-join PvP, DAOC style 3-way FFA castle sieges, and old-school RPG roots, all held together with the core Guildwars experience of customized builds, skill-based (in all senses of the word) combat, and fun now, rather than fun at the end of a steep leveling curve. GW2’s aiming for a lot of goals, but I think they’re all cohesive. It feels like a novel to me – like it covers a lot of ground and subject matter, but is unified by some really fundamental themes that resonate with many different people. Or at least has that potential. It makes me sad that they do not customize those messages as the hours pass.